South Korea Sends 1st Train In Plan To Reconnect With North The two Koreas have taken another remarkable step toward linking up — by train. 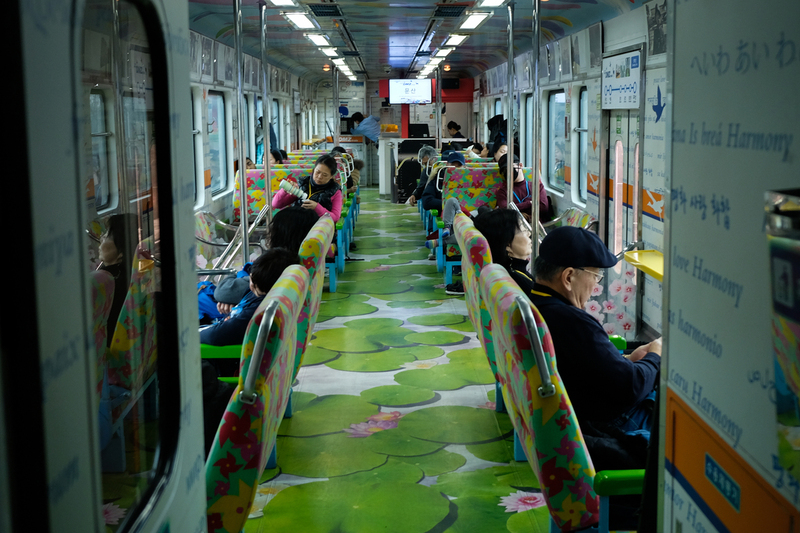 The interior of the DMZ train, a three-car tourist train. It is decorated with words such as "love," "peace" and "harmony," in several languages. Progress toward an agreement between the U.S. and North Korea may have slowed, but South Korea has taken another remarkable step toward linking up with the neighboring regime — by train. Last week, a South Korean train crossed the border into North Korea for the first time in a decade. It was a prelude to the two Koreas reconnecting their railways, after being separated for more than half a century. The DMZ train sits at the Dorasan Station, just south of the inter-Korean border. South Korea is determined to push railway development forward, despite the lack of progress on the North Korean nuclear issue. 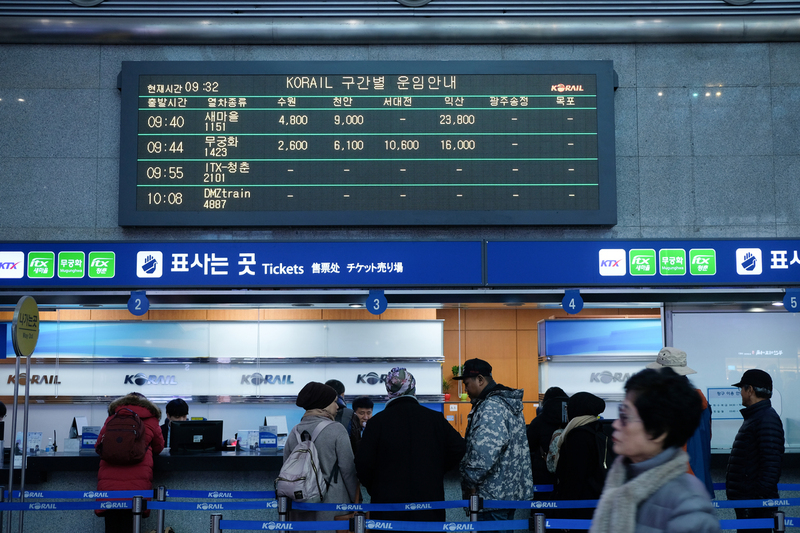 At the Dorasan Station, the last stop before the inter-Korean border, South Korean Unification Minister Cho Myoung-gyon on Friday saw off nearly 30 engineers and officials, as they prepared to head north. "Through the connected railways, South and North Korea will prosper together," he said, "and solidify peace on the Korean Peninsula." 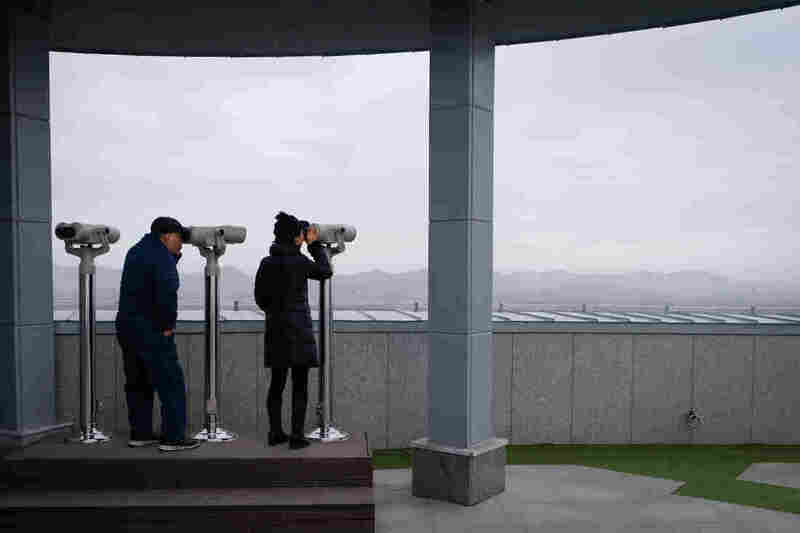 Visitors look into North Korea from the Dorasan observatory. North and South Korean inspectors will cover about 1,600 miles over 18 days, surveying the state of the rails in North Korea. They will bed down in a sleeper car. Other parts of the train are stocked with bottled water and instant noodles. South Korea is pushing hard to break ground on the reconnection project by year's end. "You will visit train stations and cross hills and rivers in North Korea that no outsiders have visited before," Cho told the surveyors. Hinting at what shape inspectors might find the north's railways, North Korea's leader Kim Jong Un joked at an April summit that it would be an embarrassment if South Korean President Moon Jae-in were to travel by train to his country, suggesting the ride would not be smooth or comfortable. Signs for the DMZ train above ticket windows at the Yongsan Station in Seoul. South Korea had to apply for an exception from the United Nations committee that manages sanctions on North Korea, and the U.N. Command, which oversees security in the demilitarized zone on the countries' border. And that was just for the survey. South Koreans are aware that reconnecting the rails is unlikely to happen without progress toward denuclearization. And although North Korea's Kim has pledged to abandon his nukes, talks between Washington and Pyongyang have been stalemated. The United States apparently gave its tacit blessing to the railway survey, despite complaints that inter-Korean engagement is getting too far ahead of progress on denuclearization. 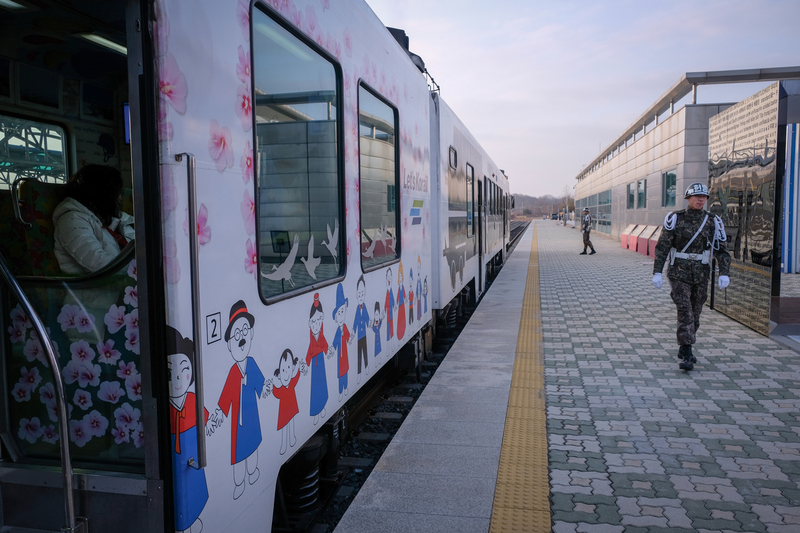 For now, tourists can ride the DMZ train, a three-car tourist train, as far as Dorasan. 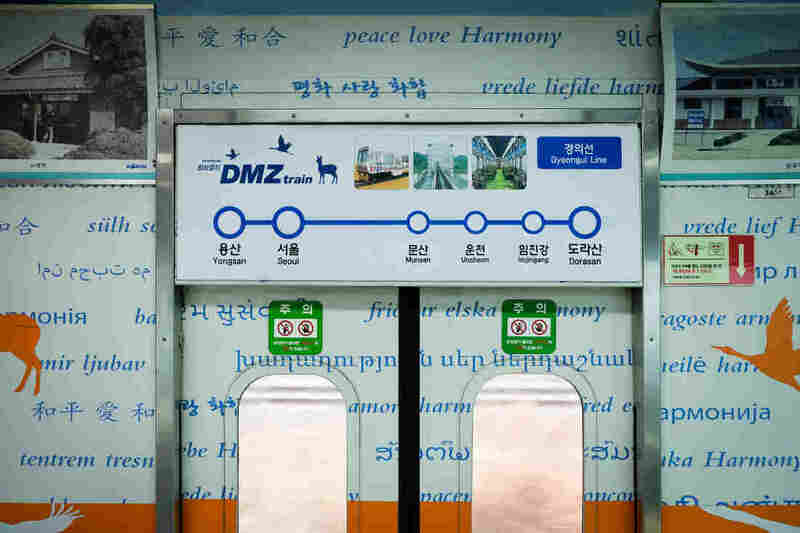 It is decorated with words such as "love," "peace" and "harmony" in several languages, pictures of animals that inhabit the demilitarized zone, including deer and cranes, and pictures of American soldiers fighting in the Korean War. A map of the DMZ train's route through South Korea on the Gyeongui Line. The line's tracks run through Pyongyang and extend to North Korea's border with China. The train runs on the Gyeongui Line, which was built in the early 1900s. It runs through Pyongyang, the North Korean capital, and goes as far as Sinuiju, on the Yalu River, which forms the border with China. Some parts of the north have not seen a South Korean train since the peninsula was divided in 1945. Trains briefly carried supplies to Kaesong, a joint industrial zone just north of the border, in 2007, but service was suspended amid tensions the following year. The current plan is for railways running up and down the east and west coasts of the Korean Peninsula, and a line linking them in the middle. The lines would connect to others leading on to the rest of Asia and Europe. 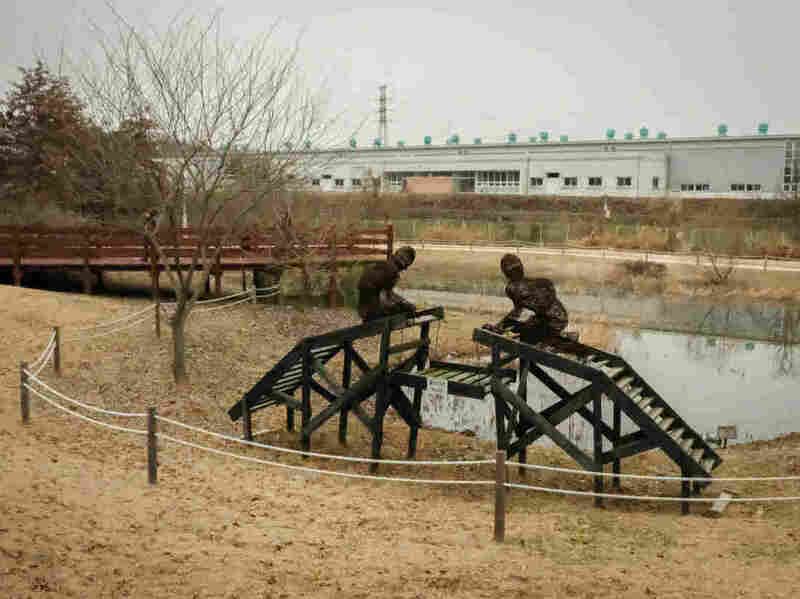 A statue symbolizing the divided state of the Korean people. "I look positively at the reconnection of the railways," says Chang Yoon-hee, a nurse's aide who rode the DMZ train to Dorasan. "And if it happens, I want to ride this train not just to Pyongyang, but to Russia and Europe." The railways are part of a blueprint proposed by South Korean President Moon for economic integration between the Koreas and, in the process, to nudge the north away from its centrally planned economy toward a more market-driven one. But at a conference this week, Seoul National University economics professor Kim Byung-yeon questioned whether the proposed infrastructure projects would actually do that, or merely inject cash into the north's inefficient state-owned companies. "If these projects are implemented, I will expect huge cost, but less efficiency," he commented. What North Korea lacks is "not infrastructure, but private enterprises producing goods and services," he added. 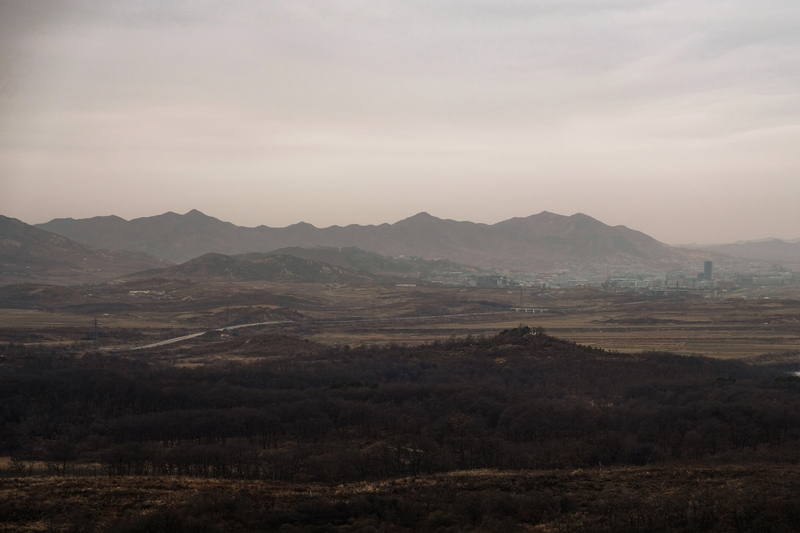 The view from the Dorasan observatory, looking into North Korea, with the city of Kaesong and its joint industrial zone in the distance. Economists draw parallels with Germany, whose 1990 reunification costs continue to mount — up to $1.7 trillion, by some estimates, in federal government subsidies to poorer eastern states. If that parallel wasn't obvious enough, there's actually a chunk of the Berlin Wall, sitting on the platform at the Dorasan Station. There's a clock on either side of the chunk, counting down the days, minutes and seconds to unification. Germany's is complete. Korea's has yet to begin.